Bob Brewer, Anchor’s resident expert on beer & brewing, takes a behind-the-scenes look at the craft brewing process and the terminology used in the Anchor brewhouse. What is “dry hopping”? This brewing term refers to the process of adding hops to the beer while it is in the cellar tank, in addition to the hops added in the brew kettle during the boil. At Anchor Brewing, for those products that are going to be dry hopped, we will first fill a number of mesh bags with whole cone hops. Bags of hops are transferred from the hop room to the cellar in this trusty cart. These bags of hops are then placed into the cellar tank just before the beer is transferred from the fermenter and, like a tea bag used for making sun tea, allowed to cold steep in the beer throughout the cellaring process. Hops contain compounds that add the bittering, flavor, and aroma that contribute to the character of the beer. 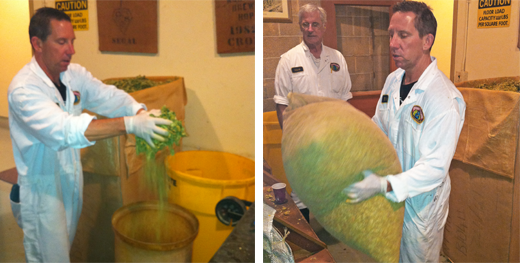 Traditionally, hops are added to the beer in several stages during the boil. Since the heat of the kettle alters the hop compounds depending on how long they are boiled, these additions are timed so as to create the desired profiles. There are, however, highly volatile esters in the hops that evaporate or alter so quickly in the boil that they are lost no matter when they are added. Dry hopping allows these esters to be steeped into the beer in a cold environment, where they add aromatic and flavor characteristics to the finished product that cannot be achieved in the kettle. The process of dry hopping originated as a method of preservation whereby whole hops were added to beer casks prior to shipment. The classic India Pale Ales of old were generously dry hopped in this manner for their long sea voyage. Although the era when hops were used as a preservative is long past, the tradition of dry hopping for aroma and flavor remains with us. Liberty Ale, the first modern American ale to employ dry hopping, owes its distinctive hop bouquet to dry-hopped whole-cone Cascade hops. Anchor IPA is dry-hopped with Cascade, Apollo, Citra, Nelson Sauvin, and Haas Experimental 431 hops, giving the beer its spiky bitterness and distinctively complex aroma. 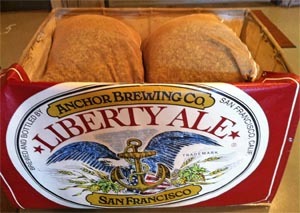 Pour yourself a dry-hopped Anchor brew and celebrate the dry hopping tradition!